In this post, you’ll learn the rules you need to take into account when using drones in Belize. Unfortunately, the rules for using drones in Belize are stringent. Currently, only commercial users are allowed to bring a multicopter to Belize if they have been mandated directly by a Belize based company or organization. Unfortunately, it is currently not possible to capture vacation memories from Belize with a camera drone. However, it should be possible in the future after a change in the law to introduce a drone to Belize for private purposes. The complete documents must be sent by email to info@civiaviation.gov.bz and elizabeth.regaldo@civilaviation.gov.bz. After submitting your application, it will be reviewed by the Aviation Authority. After checking, you will need to visit the AIS office (first floor at Philip Goldson Airport) and pay a fee of 30 BZE (about 12 €). With the proof of payment, you will eventually receive from the Department of Civil Aviation your import and flight authorization for Belize. 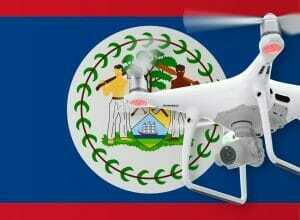 We have researched the listed drone regulations for Belize to the best of our knowledge. We cannot guarantee the correctness of the information. If you want to be on the safe side, contact the competent aviation authority. Alternatively, you can also ask the embassy in your country for further information about the regulations. Please leave us a comment when you receive news and/or gain experience with your copter in Belize!